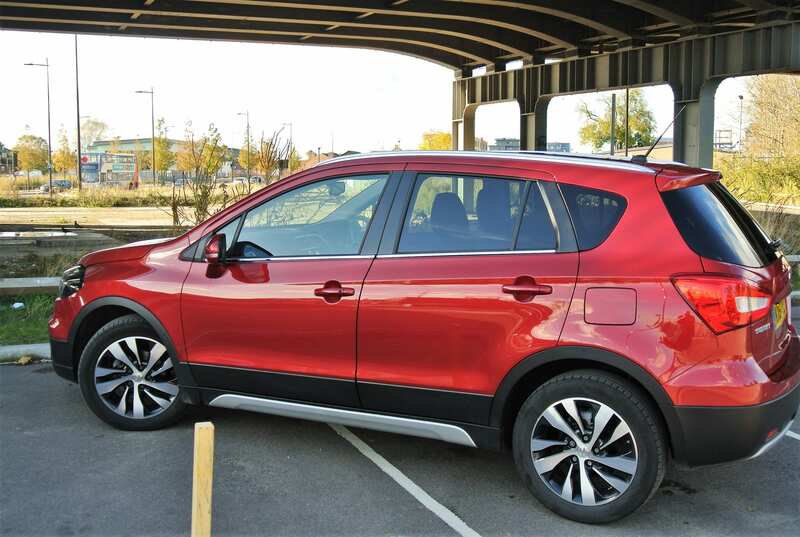 It is almost too easy to classify a car like this Suzuki as a ‘sporting utility’, highlights Iain Robertson, who likens the S-Cross to more low-line and more capable family cars, like Volvo’s Cross-Country, Subaru’s Impreza, or Audi’s quattro model lines. It is difficult for me to conceal my distrust in and broad loathing of the populist SUV motoring scene. While I can comprehend its unwarranted sector growth, not least from the ‘Let’s Off-road!’ brigade, few of whom would ever appreciate the lack of capabilities of most SUVs, that it has become the default mode of transport for so many others is no less than unconscionable. The majority of SUVs are little more than high-riding versions of their lesser hatchback brethren that pander to consumer demand, often without much compensation in the dynamics arena. While product quality can be immensely variable, the impression of high-quality is not immediately obvious, especially in a number of modern motorcars. Fortunately, the days of ‘duffers’ are genuinely in the past. Old Fiats produced by Russian Lada at its Black Sea Togliatti plant are no longer imported to the UK. Much the same applies to Malaysian Proton and even its Far Eastern sidekick, the Perodua. Mind you, Dacia continues to produce previous-generation Renaults at its Romanian factory, the UK imports of which are about as close as we get to inexpensive and quite shoddily-built motorcars these days. Suzuki is a fascinating brand to me. It produces immense quantities of cars in its several plants worldwide, although our right-hand-drive market receives imports only from its Japanese, or Indian factories. As a carmaker, it has always strived to be ‘different’. While we used to refer to Fiat as being the ‘small car master’, I believe that Suzuki should be accorded that title, as most of its models seem to be downsized variants of what might be termed mainstream manufacturing. Yet, Suzuki is smart. Its packaging for occupants and their personal goods is first-class. 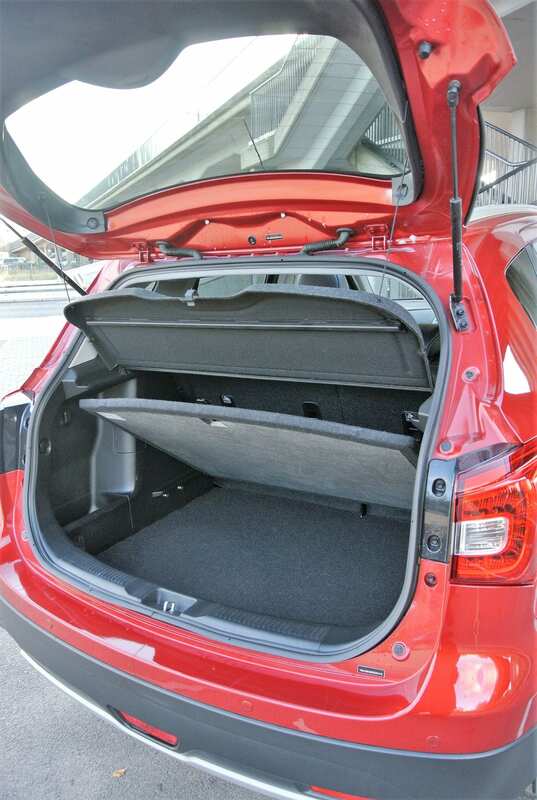 Despite having to accept compromise, due to the vast array of potential end-users and their varying sizes, from the smallest Celerio to the largest Vitara, the space utilisation exhibited is fantastic. In fact, the company’s Skoda Fabia-sized Baleno model is a perfect case in point, in that it is not as dimensionally large as a Ford Focus, nor as compact as a Ford Fiesta, but it provides exceptional occupant space that is better than the cramped ‘Blue Oval’ rivals. Lower-end Suzuki models might be criticised for their ‘look-at-me-and-I-dent’ propensity, although the firm’s pursuit of the Colin Chapman (of Lotus sports car fame) principle of ‘adding lightness’ is to be applauded. It is an intriguing situation, as those models meet all crash safety requirements, yet are notably lighter, thus demanding less fuel and emitting lower levels of pollution, while providing first-rate driving experiences. However, the S-Cross model is both different and unusual. While some people classify it as an SUV, the simple truth is that it is far closer to being a rival to an Audi A3/A4 quattro, between which German models it sits quite comfortably. It is taller than either of them but is not the equivalent of either a Q3, or Q5, which are definitely SUVs. Even the way in which the S-Cross drives is far more saloon-like than high-rider but I shall come to that in a moment. From the instant you set eyes on the S-Cross, it is clear that it possesses some rugged design details, such as the black edges to the wheel-arches and the body cladding on its flanks. Yet, the Volvo Cross-Country models, as opposed to the XC variants, also boast similar protection, and they are not regarded as SUVs. Of course, the S-Cross also has a prominent, toothy, chromed radiator grille, although it is a styling derivation that does provide the car with greater street presence. With affordable pricing, a long-standing aspect of Suzuki’s remit, from £17,499 (1.0-litre turbo SZ4), rising to £24,749 in the test car’s 1.4-litre SZ5 guise, to which you must add £1,350 for the excellent 6-speed automatic transmission (with paddle shift), all prior to dealer discounts being applied (which amount to around £2,500 at present), value for money is standard. 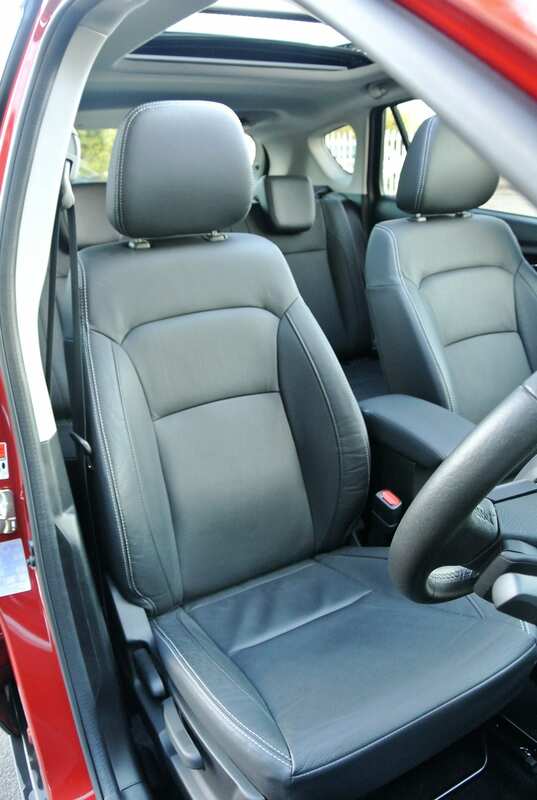 While it looks great on the outside (do not forget the £500 charge for the metallic paint finish), its interior, accessed keylessly, follows a not dissimilar and satisfyingly conservative styling direction. As the top SZ5 version in a limited palette of models, the hide-covered seats that are adjustable for rake, reach and recline are accommodating and exceptionally supportive. Leather is carried onto the steering wheel rim (rake and reach adjustable), parking brake handle and gear-selector. While the dashboard is not entirely ‘soft-touch’, the dark grey plastic plank across its main facia is compliant, a factor that does help greatly in reducing in-car noise and enhancing refinement. In terms of clarity, the S-Cross dash lacks nothing, yet remains uncomplicated and straightforward. The driver’s door closes quietly, with a high-end clunk that highlights its weightier, sound-deadened qualities. 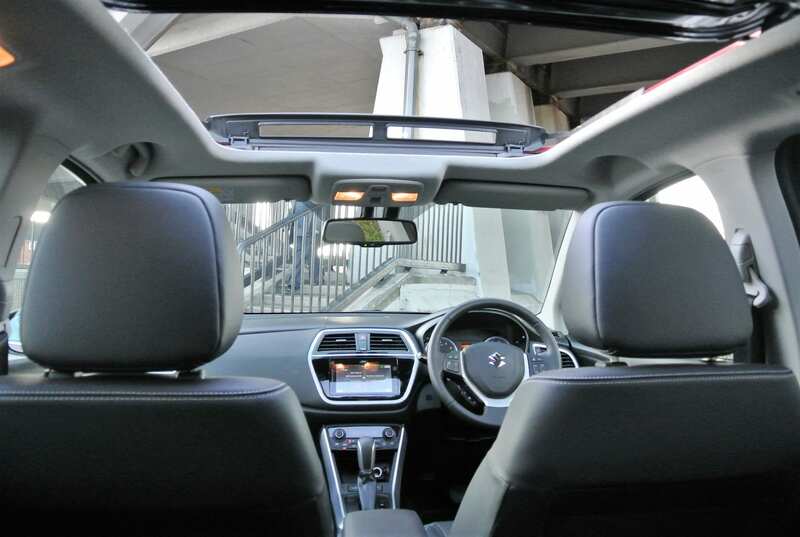 Above the occupants’ heads is one of the largest twin-opening, electric, glazed sunroofs fitted to any car sold in the UK. A full-length sunscreen shades the interior. The equipment list is comprehensive and includes the usual safety and driver aids, supplemented with twin-zone climate control, an on-board computer, adaptive cruise control and attractive, 17.0-inch diameter polished alloy wheels. The AllGrip four-wheel drivetrain is permanent (like quattro), although it can be tailored to both the driver’s and conditions’ needs, via a small twist controller between the front seats, which also includes a differential lock for really low-grip situations. On the dynamic front, the S-Cross benefits from truly magnificent steering. Pleasantly weighted and surgically precise, the car’s directional stability is fantastic and a perfect line around corners can be dialled-in, the car remaining balanced and faithful to input. 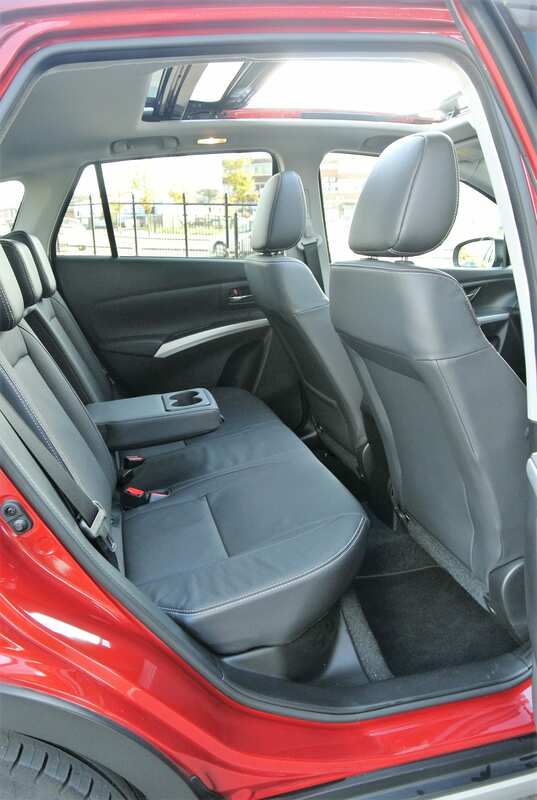 It is helped by firmly compliant suspension that does not induce body roll, rides comfortably and resists both dive and squat characteristics, thus imparting a sense of unerring security to the driver and passengers. While grip levels are high, an otherwise benign handling envelope can be overstepped by barrelling into bends with abandon. In extreme circumstances, the S-Cross will power-oversteer but it always remains controllable and fun. Powering this SZ5 version of the car is a 1.4-litre, four-cylinder, turbo-petrol version of the BoosterJet engine. It develops a modest 140bhp and a decent 162lbs ft of torque. It is a cracker of an engine, despite its relatively small capacity, and can despatch the 0-60mph benchmark in a cool 9.7s, although it feels much quicker thanks to its generous mid-range pull, with a top speed of 124mph. It promises 50.4mpg on the Official Combined cycle and emits just 127g/km CO2, which equates to £165 first-year road tax, £140 annually thereafter, all of which is not bad at all for an automatic gearbox model. 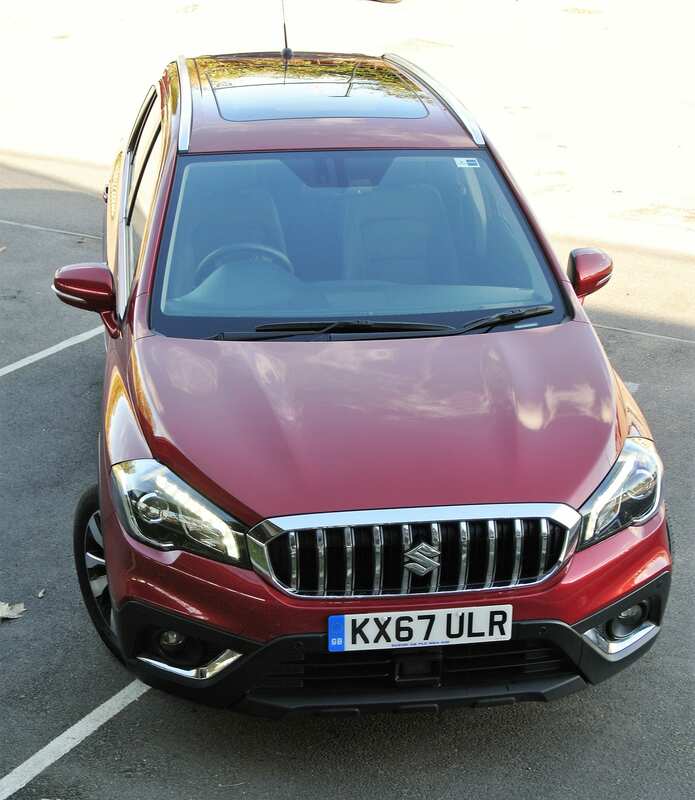 Overall, the Suzuki S-Cross is an impeccably balanced, good looking, sturdily constructed, well-equipped and incredibly easy car to live with. It is immense fun to drive, whether just cruising the A-roads (50mph equates to 1,500rpm), or mixing it with motorway traffic, and there is bags of space inside. However, as it displays none of the undesirable traits of a typical SUV, it is either the best SUV on sale today, or simply not an SUV at all! Conclusion: While Suzuki is not the default option for buyers of 4WD cars, it comes strongly recommended for its all-round competence, good value and first-rate driving experience. Before narrowing your shortlist to Ford, Nissan, Vauxhall, or PSA, give the S-Cross a closer look, I can assure you, you will be surprised. « Malta Diary; The ant sees off the elephant – in 1798 the Gozitans expelled Napoleon Bonaparte and the French and Gozo became ‘independent’!